Is Geothermal Heating and Air Right For Me? 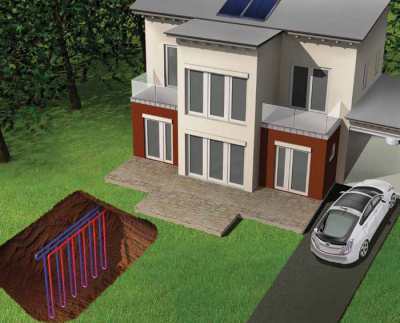 How Does Geothermal Work With A Closed Loop System? areas, the higher the rate of heat transfer between them. Refrigerators, air conditioners, and heat pumps all operate by pumping refrigerant through a sealed system in a way that creates two distinct temperature zones: a cold zone and a hot zone. The simplest example of such a system is the universally familiar home refrigerator. In a refrigerator, a fan blows the air inside the box over tubes containing refrigerant that is very cold (typically below 0°F). Heat flows from the interior air to the cooler refrigerant. The refrigerant is then pumped to the high-temperature section, which is exposed to room air outside the refrigerator box. Because the refrigerant is hot in this zone, it gives up heat to the relatively cooler air in the room, before flowing back to the cold zone to begin the loop again. An air conditioner works in exactly the same way, except that it extracts heat from the air inside a room or building and transfers it to the air outside the building. A conventional heat pump adds a reversing capability, so the hot zone and the cold zone can be switched. With the zones reversed, it can extract heat from the outside air in the winter and transfer it inside. Granted, being able to extract heat from frigid winter air seems like it shouldn't work. But it will if we can expose the cold air to refrigerant that's even colder than it is. And modern heat pumps can do that. If the outside air gets extremely cold, though, a heat pump just can't make the temperature of the cold zone low enough. That's when supplemental electric heating elements kick in. Working much like a toaster, they supply warmth to the house, but at very high relative cost. Standard heat pumps, while relatively simple to operate, face one major challenge. Their operating efficiency is lowest when demand is highest; that is, heat pumps have to work hardest when we want the most from them. As we've just seen, a regular heat pump extracts heat energy from outside air in winter, and rejects heat to outside air in summer. Unfortunately, the colder the outside air, the more difficult it is to extract heat from it, and the hotter the outside air, the harder it is to transfer heat to it. The temperature difference between the air and the refrigerant is small in both cases, lowering heat transfer rates within the system. Yet, the colder it gets outside, the higher the rate of heat loss through windows, around doors, and through walls and roofs, and the more heat we need to pump inside to keep indoor temperatures comfortable. In summer, we face a similar dilemma. The hotter it gets outside, the higher the rate of heat infiltration into the house, and the more heat removal we need to maintain comfort. A geoexchange system eliminates this dilemma by using the relatively constant temperature of the earth as a heat source in winter and a heat sink in summer, instead of outside air. Throughout most of the U.S., the temperature of the ground below the frost line (about 3 to 5 feet below the surface) remains at a nearly constant temperature, generally in the 45°–50°F range in northern latitudes, and in the 50°–70°F range in the south. So, in the winter, a geoexchange unit can extract heat from ground that's relatively warm compared to the cold outside air, and in the summer, it can discharge heat to ground that is relatively cool, compared to the hot outside air. Since the difference between the refrigerant temperature and the ground temperature remains relatively high in both seasons, so do heat transfer rates. Consequently, the geo exchange system operates at much higher year round efficiencies than a standard heat pump. The unique aspect of the geoexchange system, and the key to its lengthy list of benefits, is the ground loop. The ground loop provides the means of transferring heat to the earth in summer, and extracting heat from the earth in winter. Physically, the "ground loop" consists of several lengths of plastic pipe typically installed either in horizontal trenches or vertical holes that are sub-sequently covered with earth and landscaping of your choice. Water inside the ground loop piping is pumped through a heat exchanger in the geoexchange unit. In the summer, it absorbs heat from the refrigerant hot zone and carries it to the ground through the ground loop piping. In winter, it absorbs heat from the earth through the ground loop, and then transfers that heat to the refrigerant cold zone. The length of the ground loop will be determined by the heating and cooling loads, which are determined in turn by the size of your home, its design and construction, its orientation, and the climate where you live. Once the ground loop is installed, you can typically forget about it. The polyethylene piping (the same type used for cross-country natural gas lines) does not degrade, corrode, or break down in ground or water contact, so sound installations are expected to last 50 years or more. One of the complaints often heard from the owners of standard heat pumps is that the air coming from the vents in the winter is cool, creating a sense of draftiness. While the air is actually warmer than room temperature by several degrees, it is much cooler than the average person's skin temperature. Heat transfer principle #1 says that heat will flow from our skin (an area of warmer temperature) to the air coming from the vents (an area of cooler temperature). And that makes the air feel cold and "drafty." Geoexchange systems don't have this problem. Because the ground temperature is much warmer than typical winter air temperatures, the geoexchange system can make the air much warmer than our skin–typically well over 100°F. Since the air from the vents is at a higher temperature than our skin, heat flows from the air to our skin, making us feel warm and cozy. Geoexchange systems also provide superior year-round humidity control, and modular designs often make zoned heating and air conditioning practical– for even more comfort control through the entire house. GeoExchange is the most energy-efficient, environmentally clean, and cost-effective space conditioning system available, according to the Environmental Protection Agency. The EPA confirmed the superior efficiency of GeoExchange, finding that even on a source fuel basis – accounting for all losses in the fuel cycle including electricity generation at power plants – GeoExchange systems average 40% greater efficiency than air source heat pumps, 48% greater efficiency than gas furnaces, and 75% higher efficiency than oil furnaces. Today’s best GeoExchange systems outperform the best gas technology, gas heat pumps, by an average of 36% in the heating cycle and 43% in the cooling cycle. GeoExchange systems use the Earth’s energy storage capability to heat and cool buildings, and to provide hot water. The earth is a huge energy storage device that absorbs 47% of the sun’s energy — more than 500 times more energy than mankind needs every year — in the form of clean, renewable energy. GeoExchange systems take this heat during the heating season at an efficiency approaching or exceeding 400%, and return it during the cooling season.